DETROIT (Bloomberg) -- General Motors Co. will probably report that losses in Europe for the first quarter led to a decline in profit, raising pressure to find a solution for its Opel/Vauxhall unit, which is undercutting the company's U.S. recovery. On Thursday, GM likely will report its ninth-straight profitable quarter since emerging from bankruptcy in 2009. The automaker may report that first-quarter profit excluding some items fell to 85 cents a share from 95 cents a year earlier, according to the average of 16 analysts surveyed by Bloomberg. The first-quarter results may resemble Ford Motor Co.'s profit, which fell 45 percent to $1.4 billion as rising North America income was diminished by losses in Europe. Slowing growth in China and increasing competition in South America are exacerbating both companies' reliance on their home continent. "I'm biased by what happened at Ford," David Whiston, an analyst with Morningstar Inc. in Chicago, said this week in a telephone interview. "The question is: Will it be a repeat of a very healthy North American business and then a very weak international business?" Europe has been a persistent problem for GM. 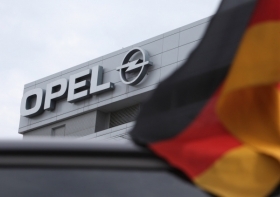 After the board decided not to sell its German-based Opel unit, losses have continued and deepened. The European operations were on target to break even last year until November when the company said those plans were off track as the economy worsened. GM CEO Dan Akerson is trying to fix operations in Europe after losing $747 million before interest and taxes in the region last year and $15.6 billion since 1999. In February, GM announced an agreement to acquire 7 percent of PSA Peugeot Citroen as part of an alliance that includes purchasing and vehicle development as part of an effort to revitalize its European operations. That effort is separate from fixing Opel, which the company said would take a couple of months. Executives have rolled back that timetable. "We're in dialogue with all of the constituencies and it's multinational, given our footprint in Europe," Akerson told reporters in Beijing last week. "We hope within the next couple of months to be able to speak more specifically about the details of a plan going forward." In the January-to-March quarter, GM's car sales fell 12 percent to 271,711 in the 27-member European Union plus Switzerland, Norway and Iceland while the total market declined 7.3 percent, according to ACEA, the European automakers association. "I don't want to lead anybody to believe there's any bright spots in Europe right now, although I will say it does look like things appear to be bottoming," Steve Girsky, GM vice chairman, told analysts in April. "They are bad, the comparisons are bad, we're not sure they're getting any incrementally worse." Brian Johnson, an industry analyst with Barclays Capital, estimates that GM's Europe loss will be $390 million while Joseph Spak, an analyst with RBC Capital Markets, predicts an operating loss of $339 million. "The only positive thing coming out of Ford's comments on Europe is pricing seems to have been not as bad as it could've been," Johnson said. "Which could maybe support that we've hit a bottom." GM also probably continued to lose money in the quarter in South America, where the company is investing to introduce new products this year, Johnson said. The region "should be in the black this year," Girsky said. European and South American losses will probably be countered by North America results, which include improving U.S. sales results. GM may generate $1.68 billion in operating profit from its home continent, Johnson said. GM's U.S. vehicle sales rose 2.7 percent in the quarter while spending 11 percent less on incentives per vehicle, according to researcher Autodata Corp. Market share fell as Akerson has emphasized profit margin over unit volumes. "When you can increase sales while lowering incentives, everything else being equal, it should equate to higher earnings," said Jesse Toprak, an industry analyst with TrueCar.com, a Web site that tracks auto sales. "Especially in January and February of last year, GM had some unusually high incentives." Global revenue may rise 4.1 percent to $37.7 billion, fueled by increasing sales in China and the U.S., where deliveries of the Chevrolet Malibu and Cruze sedans increased. GM's vehicle sales in China rose in the first quarter 8.7 percent to 745,152, including joint ventures. Akerson last week announced GM plans to open 600 new dealerships in China this year and that the automaker plans to introduce one new Cadillac model in the country every year through 2016. "We strongly believe in the fundamentals in this market," Akerson said last week following the Beijing auto show. "If you didn't have confidence in the future of this country and its growth potential, you might have feet of clay. We don't." GM shares, while rising 15 percent this year before today, remain below the $33 level of the company's 2010 initial public offering. The U.S. Treasury Department sold 28 percent of GM in the IPO, and it still holds 32 percent of the common stock, acquired as part of the Obama administration's $50 billion bailout. The U.S. wants to sell for at least the IPO price, people familiar with the matter have said.